Territorial Army (TA) in an integral part of Indian Army. It’s based on the concept of having a trained force readily available ‘During War’, if required, which is maintainable during peace time at very low cost. 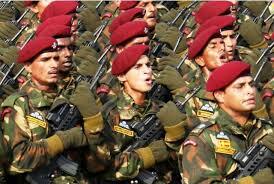 Territorial army enables ‘Motivated Young Men’ to serve the Nation in two capacities as Civilian and as a soldier. No other profession provides such an expanse of experience. It is an ideal platform for employed youth who are not in the regular forces but have a passion to serve in the forces. Their love for the country helps them to contribute their might for defence of the country when duty calls. Only male citizens of India and Ex-service officers who are medically fit. QUALIFICATION – Graduate from any recognized university. EMPLOYMENT – Gainfully employed in Central Govt/ Semi Govt/Pvt Firm/Own business/self-employed. Note- Serving Employees of Armed Forces/Police/Para Military Forces are not eligible. All desirous civilian candidates can obtain APPLICATION FORM, from EMPLOYMENT NEWSPAPER or download from www.indianarmy.gov.in (FREE OF COST) and send it along with self addressed stamped envelope of 28 x 12 cms size, two passport size photographs and postal stamps worth Rs. 12/- (Rs. 25/- for J & K) affixed on envelop (NO OTHER COST FOR SUBMISSION) to the respective TA Group Headquarters as per the area. Candidates whose applications forms are found correct will be called for screening (written exam and interview), by a Preliminary Interview Board (PIB), at the respective Territorial Army Group Headquarters. Service certificate by candidates employed in Central Govt./ Union Territory / State Govt. / Semi Govt. / Private Sector Authenticated by Head Office. Self-employed candidates or having own business are required to submit an Affidavit on Non-Judicial stamp paper of minimum value duly attested stating nature of self-employment and income earned annually. Ex-Service Officers of three services should send their applications along with release order and release medical board direct to AddI Directorate General TA, Integrated HQ of MoD (Army), ‘L’ Block, New Delhi-01. The candidates will be screened by an Army HQ Selection Board (ASB) held at AddI Dte Gen TA, GS Branch, ‘L’ Block, Church Road, New Delhi which is followed by a Medical Board at New Delhi (Armed Forces Clinic) and Police Verification for shortlisted candidates. The above change will be implemented with effect from the PIB August 2016 onwards. Candidates whose application forms are found correct will be called for Writtem Test and on qualifying the Written Test will be called for an interview by Preliminary Interview Board (PIB) at their respective TA Group Headquaters. Successful candidates on clearing PIB will further undergo SSB and Medical Board before final selection. 1. One month basic training in the first year of commission. 2. Two months annual training camp every year including the first year. 3. Three months Post Commissioning training within first two years at IMA Dehradun. To relieve the Regular Army from static duties, assist civil administration in dealing with natural calamities and maintenance of essential services in situations where life of the communities is affected or security of the country is threatened and to provide support to national efforts. To provide units for Regular Army, as and when, required. Infantry Battalions including Home and Hearth. Officers commissioned in TA Infantry may be called out for military service for longer duration depending on requirement. Pay and allowances of rank as applicable to Regular Army. Camp allowance of Rs. 10/- for Officers while attending training. Free rations, CSD facilities and medical facilities to self and dependants when embodied for training, military service or when posted on permanent staff. Facilities of leave, leave encashment, accommodation and leave travel concessions when embodied for military service or on permanent staff. Promotion to higher ranks as per authorization. Entitlement to pension for officers with 20 years and JCOs and other ranks with 15 years aggregate embodied service (actual Physical service). Ex-Servicemen status and free medical facilities to pensioners. Terminal gratuity at the time or discharge/retirement to those who do not earn pension (Other than civil govt. employees). Entitlement to all medals and awards as applicable to the regular army. Pay and allowances in addition to the military basic pay and allowances as applicable. Special increments on completion of 3 to 5 Annual training camps. Additional DA at higher rates during service embodiments by certain departments. One time incentive grant in certain departments and one time honorarium by state govts. Mufti allowance and lump sum Daily allowance in departments like ONGC and IOC. Cash award varying from Rs. 2500/- to 5000/- on award of TA Decoration/ TA Medal. Certain tax exemptions by some state govts. Family/disability Pension is also admissible as applicable to Regular Army. Leave as admissible to Regular Army personnel during embodiment of service and appointment on permanent instructional staff. Ex-servicemen status to pensioners and disability pension holders and Gallantry award winners. Free medical treatment to self and dependents in respect of all pension holders. Outfit allowance: @Rs. 6000/- at the time of commissioning and after every 7 years of physical service or 10 years of commissioned service to officers, Rs. 3200/- to Honorary Commissioned officers and Rs. 500/- to JCOs. Medals and Awards as applicable to Regular Army. In addition, TA officers are entitled to TA Decoration on completion of 20 years and JCOs and OR to TA medal on completion of 12 years meritorious service.